Is it still Bush vs. Gore? The White House insists the president was "very much looking forward" to seeing his old nemesis. "They're having -- the president and the vice president are having a private meeting today that the president invited him to come and spend a little bit of time with him, in the Oval Office, prior to the event that he's having in the Oval Office, in order to give thanks to the Nobel Prize recipients who have represented America so well, of which Al Gore is a part." A reporter interrupted Perino's ramble to note that Gore has been "deeply critical of this president's conduct in several areas" and to ask whether there's "bad blood" between the two men. Perino's response: "I don't believe so. I know that this president does not harbor any resentments, never has. He's -- he was the one who picked up the phone to call Vice President Gore, to make sure that he could make it to the event. He invited him to come and have a meeting with him prior to the Nobel Prize event. And I think he was very much looking forward to having the meeting. 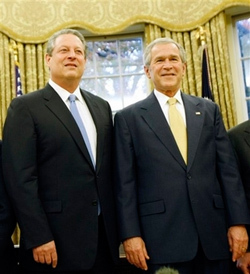 It's remarkable that, in our system of government, we have this tradition, where political rivals can put that behind them and get together and have a good conversation, and all for the good of -- in this case, Al Gore is focusing on climate change. The president has had a full seven years, with one more year to go. And I think that they'll probably have a good meeting." Perino said it was "presidential" and "gentlemanly" for Bush to invite Gore. Leaving the closed-door session, Gore told reporters that his meeting with the president had been "cordial" and "substantive," but he declined to say much else.